Home ANTI-TRACKING DEVICES 'NO-MARK' BRUSHES, CAGED DLV Soft Brush Retrofit, 24 ea. This 'No-Mark' BRUSH Wheel Set is made to replace the 1-1/4" diameter steel or plastic bottle-cap type wheels used on 'squirrel-cage' style deliveries. 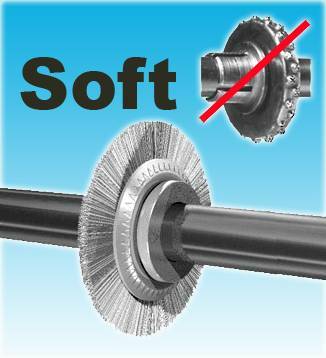 These soft natural bristle wheels are a direct retrofit that fit onto a 13/32" (0.040") shaft.